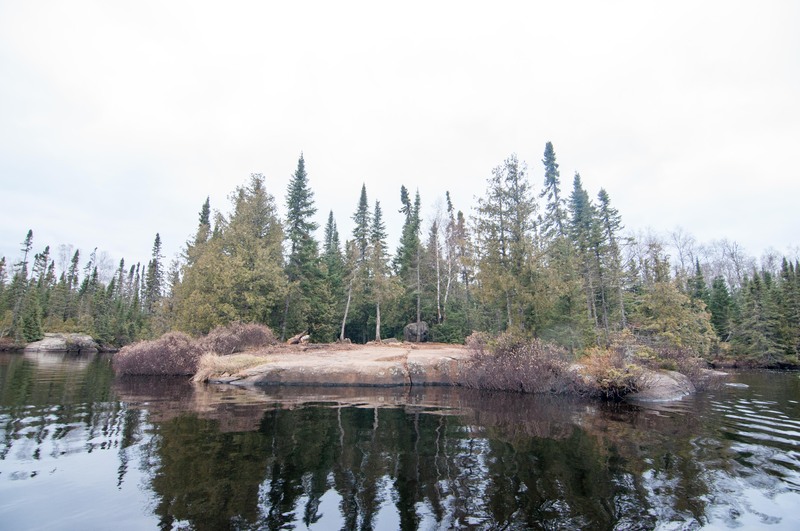 This relatively shallow 250-acre lake just south of Poplar Lake offers 8 above average BWCA campsites and slightly above average fishing opportunities for walleye, northern pike, and smallmouth bass. 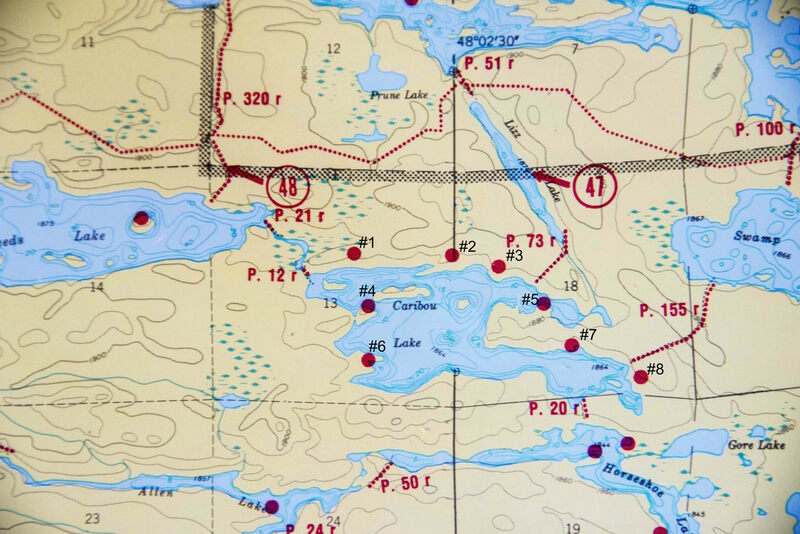 The vast majority of people visiting this lake will do so with a #47-Lizz and Swamp Lake entry permit though you could access through #48-Meeds Lake as well. 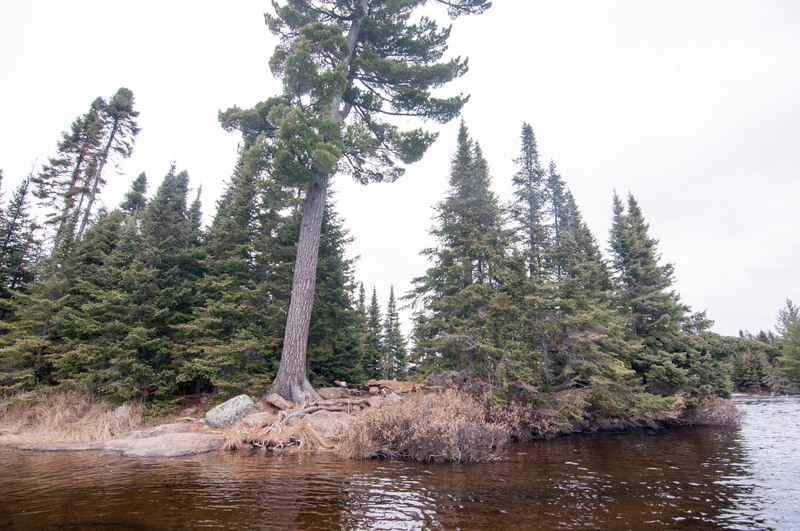 The short and easy portages between Poplar, Lizz and Caribou make this one of the most popular lakes in the mid-Gunflint trail region. 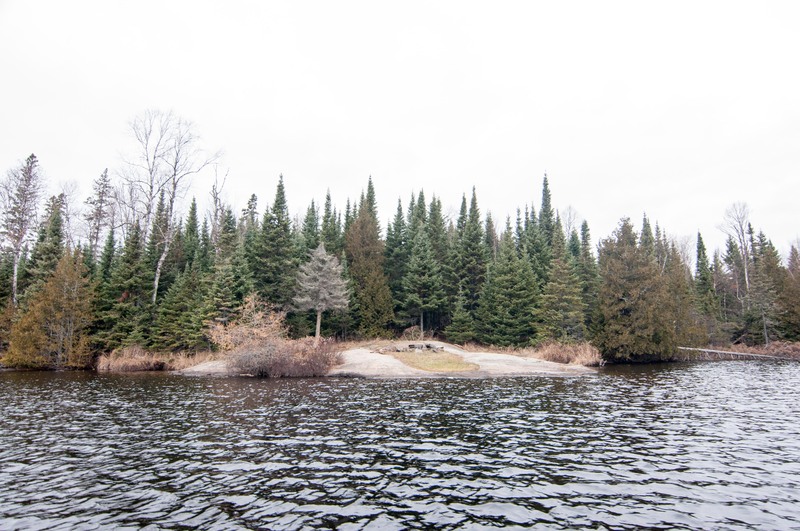 Campsites are regularly occupied throughout the busy summer months and you will encounter a lot of through traffic to other great fishing lakes and routes beyond including Horseshoe and Gaskin Lakes. 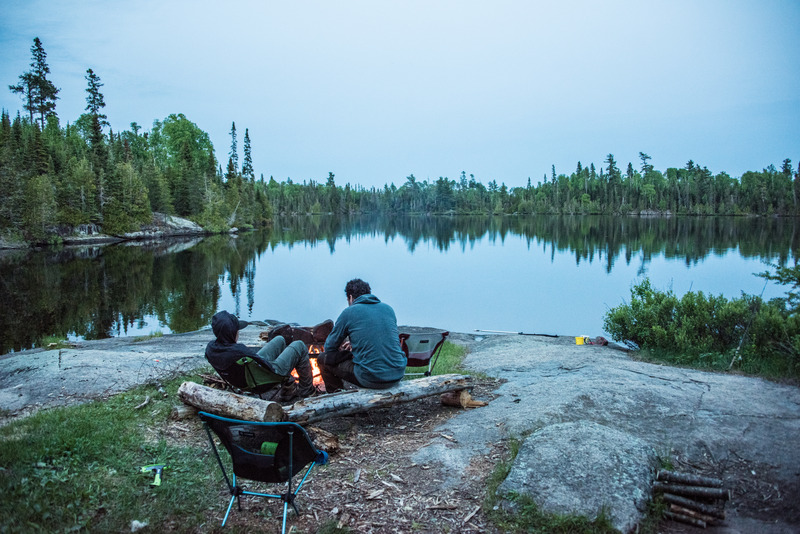 Though actual campsite availability can be a challenge sometimes they are arranged in a way that makes them still feel private once you do secure one. This is an excellent lake to slip bobber fish from camp at. 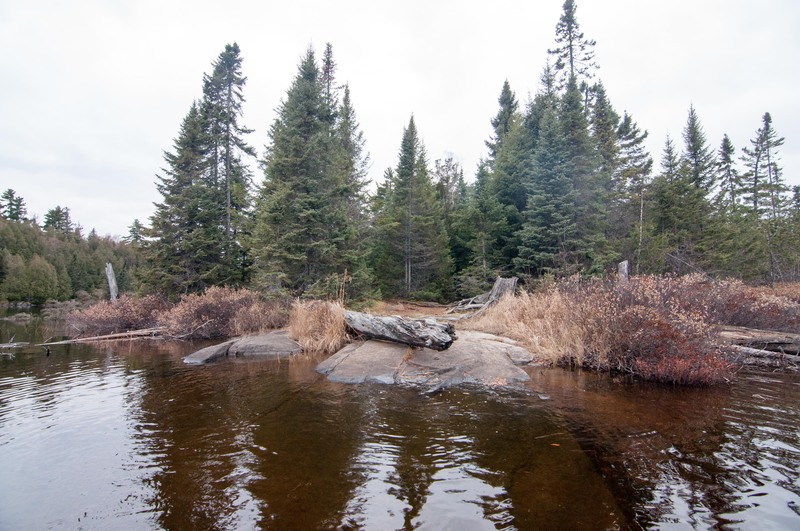 Immediately to the east of the little river and two portages that access Meeds Lake on the north side of the lake you will find this decent at best campsite. A nice sloping rock gently leads up from a nice landing to a rocky, flat fire grate area. This nice kitchen area is surrounded by two small flat tent pads and not much else. It’s a fine site and not much else. The next site down on the north shore of the lake just seems like somebody increased the size by 50%. It is nicer that it is more open and offers more views but there still isn’t more than two tent pads in the immediate vicinity of the fire grate. The flat gently sloping rock is very nice for walking around and staging gear and cooking equipment. 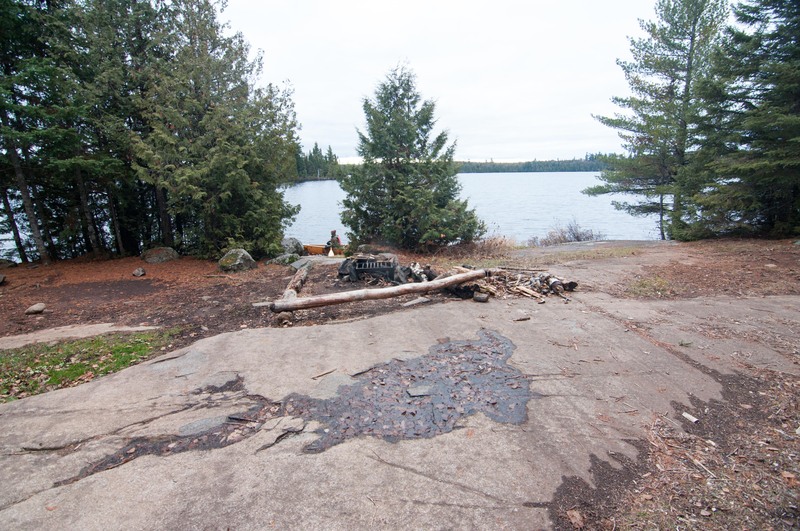 These three sites on the north side of the lake are slight variations on the same kind of campsite essentially. Gently sloping rock landing leading up to a serviceable fire grate area with tent pads just steps away in either direction. Not that there is anything wrong with that, but there is also nothing unique about it either. This site falls somewhere between #1 and #2 in terms of floor space. 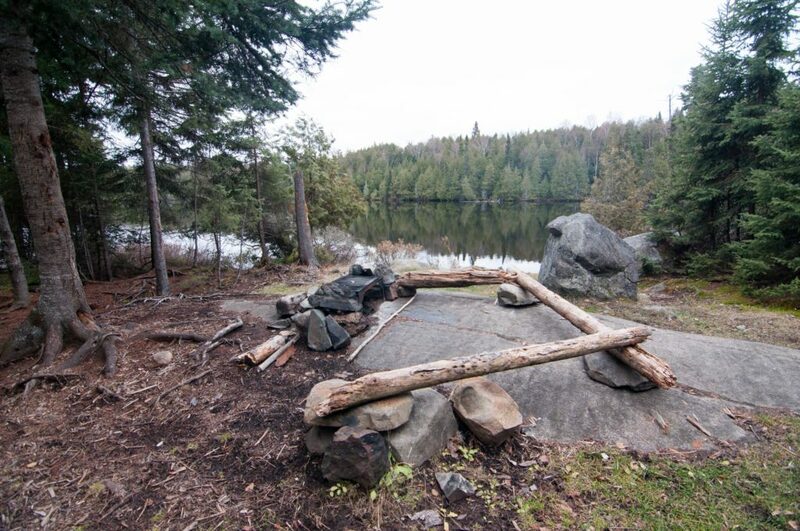 On the west end of the lake located on a point this is a great site offering a spacious fire grate and tent pad area with just the right amount of privacy provided while still maintain views of the lake. 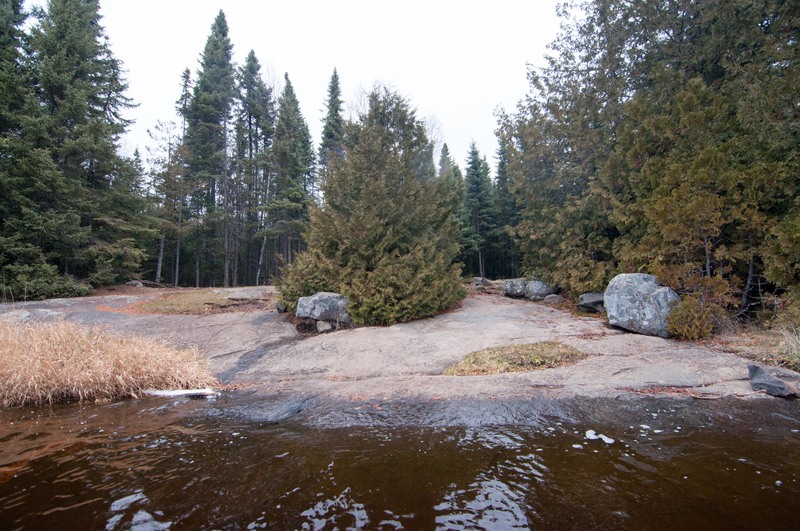 It’s a so-so landing but everything else about this spot makes it for a great spot to set up for a weekend of fishing. This is a “Beach Volleyball” camp and is the definition of a dangerously overused campsite. It is directly across from the portage into the lake from Lizz and while at one time may have been a cool spot due to the natural geology making it a nice flat table it has now become a field of dirt devoid of any vegetation. 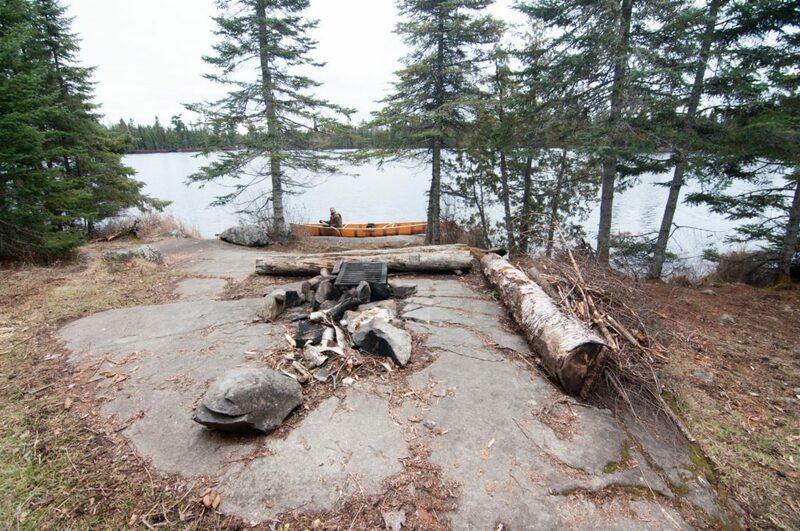 The fact that this entire campsite rests on a large flat rock means there is not much opportunity for any vegetation to take hold to begin with. To add to the challenge, it looks like this spot doesn’t go a night throughout the main open water season without being occupied. 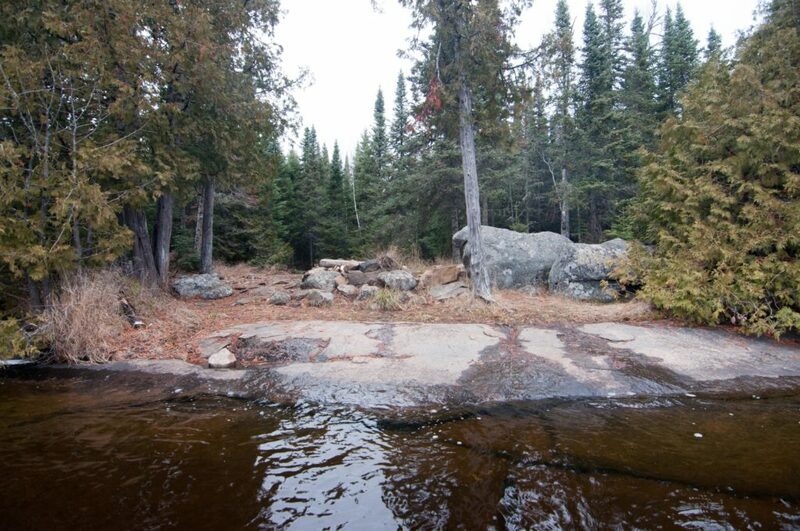 Being over used and directly across from a very busy portage would cross this site off my list but if you don’t mind these aspects, it does offer plenty of tent space and decent access via two different landings. If you want to feel like you had to work really hard just to end up car camping in the dirt at a state park, then this is the spot for you. 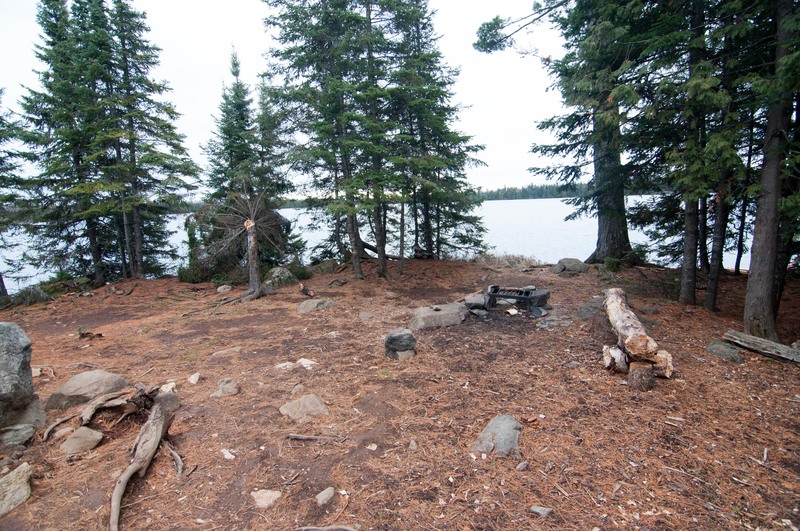 In the south west corner of Caribou Lake is where you will find this relatively cool campsite. It is nice and flat all around with an excellent little area to set up your kitchen around the fire grate. It has two nice yet small tent pads off in the woods as well. 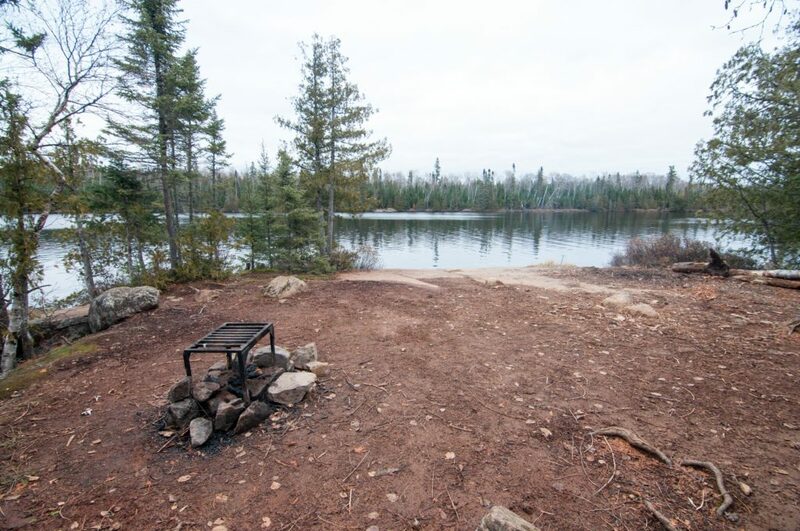 It has a unique layout, unfortunately the landing is rough and all of the water around the campsite is very shallow making for little to no opportunities to fish. It is very private. 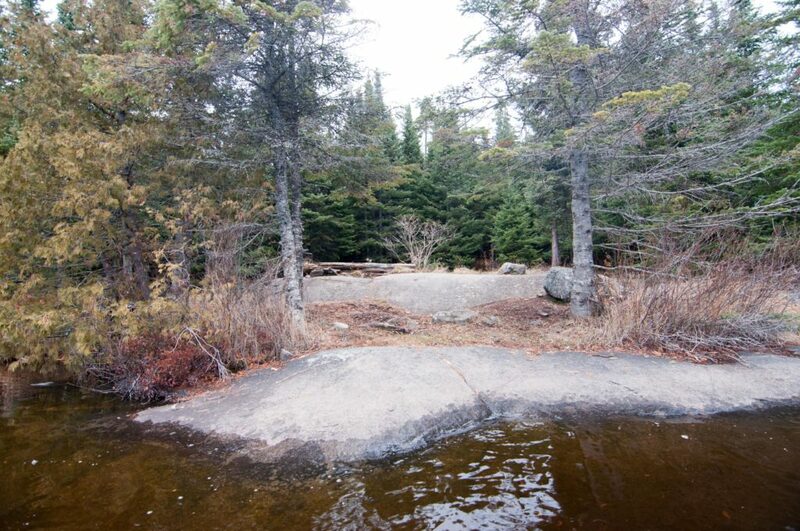 In the back bay to the easy off the main body of the lake you will find this great little campsite. One very nice tent spot with a couple of smaller one’s surround one of the most unique fire grate areas on the lake. 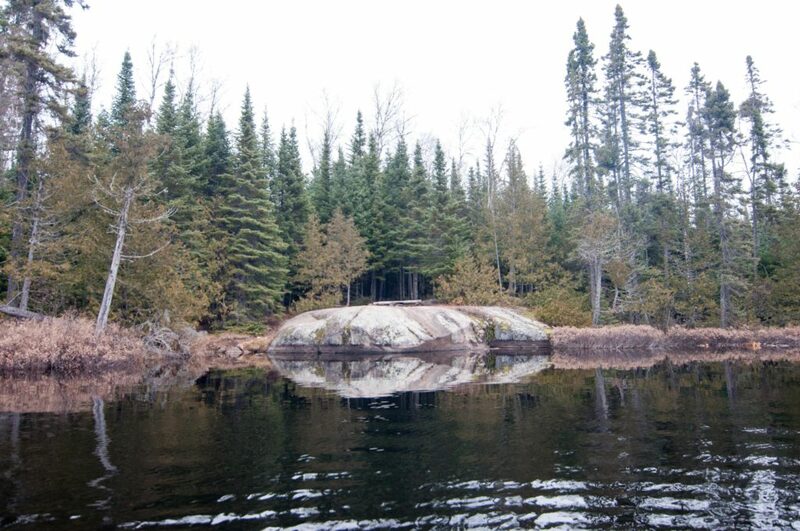 A nice rock landing makes loading your canoe quite easy, and this rock landing drops off quickly into the lake making for excellent swimming and fishing opportunities. The curved rock surrounds a nice little grass patch where you will find a very comfortable fire grate area to settle in for the evening. Though it is nicely perched atop a nice flat rock with a unique view over the lake from the fire grate there isn’t much to say about the landing or the lack of space in the back of the site. Two tent pads can be found directly behind the fire grate. Its easily the smallest campsite on the lake, and would be somewhat crowded for any group larger than four.